A few days ago Jared and I lost our car. Most ridiculously, a shredded tire resulted in wires everywhere and a totaled vehicle. We then towed said car back to Philly and experienced a second ordeal. Our tow truck driver was wasted. So it was intense. The next day while at the grocery store I was explaining this story to Erin. I was so distracted I started throwing an odd assortment of items into the cart. Lemons, smoked mozzarella (a treat when I’m stressed), delicious green machine juice, gelato. 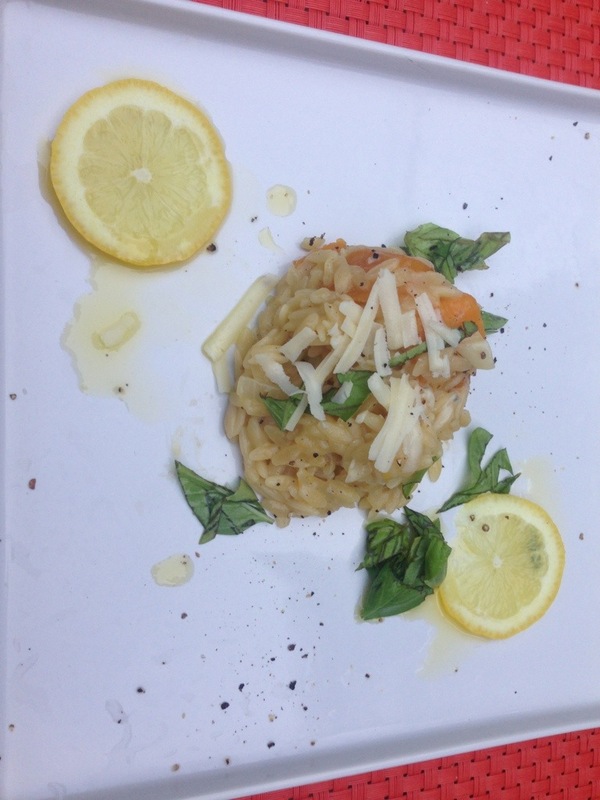 Nothing to make a meal, so I asked Erin and she suggested something squash, which led to risotto minus the arborio rice. In a large pan start sautéing the diced onion. In a few minutes add minced garlic. Meanwhile, in another pan start sautéing the squash pieces. Once onion and garlic are softened add a little more oil and orzo. Make sure all the orzo gets coated. This locks in the flavor. Then add wine a little at a time. This gets tiring so make sure you have a second person or you have the will power of twenty minutes of non-stop stirring. At this point you can turn off the squash and set aside. Put lid on them so they continue to soften. When wine is evaporated start adding broth little by little. As the broth evaporates, it should start to look thicker. This means the starches are being released and giving your pasta that creamy flavor. If the orzo is soft and the liquid is gone you’re almost done. Just add squash, cheese, herbs and zest. Serve with lots of wine and tomato and smoked mozzarella salad.